My home automation experiences started painfully, with thirteen years of mixed luck with X10 devices. 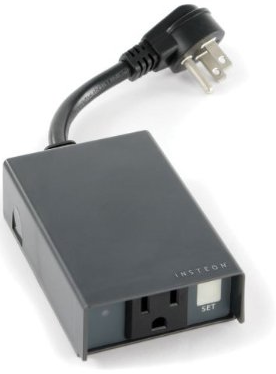 I finally cut over to Insteon products in 2008. My first device was the 2413U and the clunky HouseLinc software, and an always-on Windows system to run it. While it controlled my Insteon devices fairly well, the interface was dreadful. I literally hated every time I had to go use it. Then came the 2412N with a simple, primitive Web UI. But its clock that couldn't be configured to be self setting, despite the network connection. Even worse, the clock drifted so much that I'd have to manually adjust the time every 2-3 weeks, and again for each daylight savings time change. So you can safely say it's been a long, bumpy road. 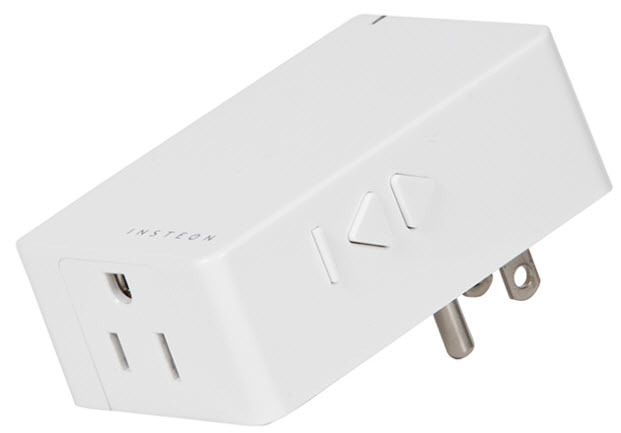 But things have gotten much easier and more affordable, with the release of the Insteon Hub in December of 2012. Built in NTP time sync and automatic geo-location via the smartphone app, to configure proper sunset and sunrise times, year-round. I'm finally confident enough in my own home's solution to share what I've done, publicly. I personally own all the items pictured below. Many of them for more than 5 years. 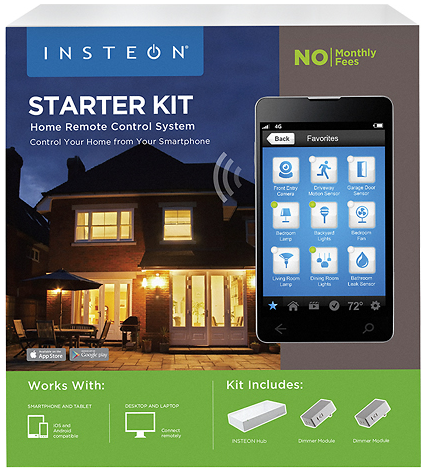 It's the December 2012 release of the new Insteon Hub that changed everything for me, and controls all of my existing Insteon devices together. This tiny unit tucked away in my basement has added considerable value and comfort to my home. Not just for me, for my family. 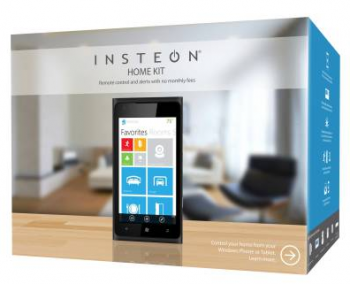 The Insteon Hub is already compatible with more sophisticated software like HouseLinc and CastleOS for fancier "if then" types of programming options down the road, should I eventually feel the need. Over time, you'll see this list of articles published at TinkerTry.com that relate to home automation grow, with a sampler below. I hope you'll find these first-hand stories helpful as you begin researching options for your home. I personally lean toward placing my orders through Amazon.com lately, so I can keep track of all my orders, and use the faster Amazon Prime shipping. The Insteon items themselves generally ship straight from Smarthome in California anyway. Let's get a few simple terms explained first. You need an Insteon controller to send commands like ON or OFF, perhaps using a built-in automated schedule. Or you can also send these commands whenever you wish, using a free Smartphone app. 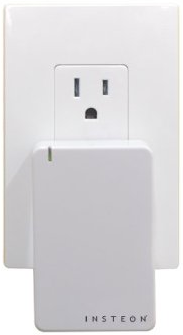 Those commands are received by your Insteon responder, a small unit typically plugged in between your wall outlet and your device, such as a lamp. That responder acknowledges it received and executed the command by sending a confirmation signal back to the controller. This way is the basics of how your controller knows when responders actually respond to requests, and if they're ON or OFF. Examples of a controller and a _responder _that work together are seen in the first 2 photos below. All signals from a Dual-Band controller are sent over your home's AC wiring via the power cord, as well as over radio waves, which are picked up and retransmitted by multiple receivers, strengthening this "mesh" network. A nice summary of the devices in this nice Smarthome table here. For particularly large homes, an Insteon RF mesh repeater can be used to help boost those signals even further, explained here. Here's a simple Insteon responder to get started on your home automation journey. Insteon ApplianceLinc On-Off Module, 3-pin 2456S3 $34.99 USD Use Insteon controller app to add a new device. Then plug in the module, press and hold the button on the side for 3 seconds, and you'll hear a little chirp. This starts the pairing process, much like Bluetooth. You app will then acknowledge it found this responder, and now allow you to control it, from inside your home, or even when not home. That easy! Insteon On/Off Module 2635-222 $49.99 USD Even though I haven't tested it, this device will begin shipping in late November 2013, and I'd recommend it over this older module above, since it's dual-band. That means it'll help retransmit Insteon commands throughout your home, helping strengthen the mesh network. Install should be very similar to the 2456S3, listed above. Insteon Water Leak Sensor 2852-222 Full write-up and video available at: TinkerTry.com/insteon-leak-sensor, with affordable 4 pack at Costco online here (don't need to be a member). 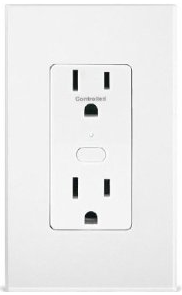 Insteon OutletLinc Remote Control Outlet 2473 It requires basic wiring skills to replace an existing wall outlet, but the look in high traffic areas like hallways is more attractive than the plug-in modules. 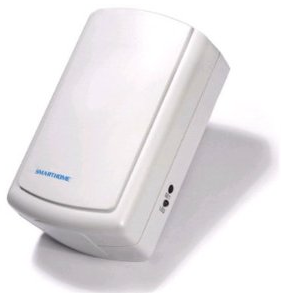 Insteon Access Point Phase Coupler 2443 If your home has a 200 amp service panel, or more than 1000 square feet, and you wish to get optimal signal reliability throughout your home, you may need to pick up one of these. It's all explained in more detail here. 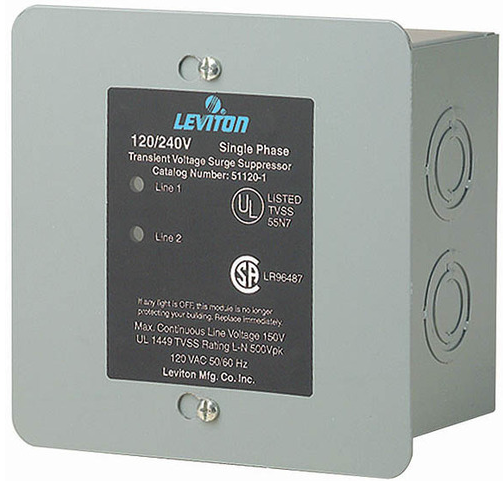 Leviton 51120-1 Panel Mount Whole Home Surge Protector and Supressor The requirement to use Insteon devices directly plugged into wall outlets means no power strip protection. So if you have lightning or power issues, you may want to protect your whole home with one of these. Installation by a qualified electrician is required, and should take well under an hour. Before I had one installed at the top of my 200 amp service panel in 2007, I was losing 1 to 2 X10 devices a year, for about 7 years. 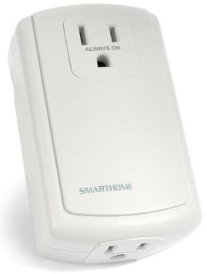 Since 2008, I've had no X10 or Insteon devices fail on me. Can't say for sure this device helped, but both green lights are still glowing, and it does give me some peace of mind for all those smaller items spread throughout the home that never had a surge protector before. Insteon On/Off Outdoor Module (Dual-Band) 2634-222 If you have outdoor devices you'd like to control that draw up to 1800 Watts, this is the way to go. 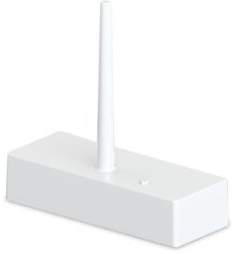 I'm using one to control an outlet located about 50' from my home, works fine, every time. you can faintly hear a bit of a click from the basement when it's triggered, so use near a bedroom after hours wouldn't be suggested. 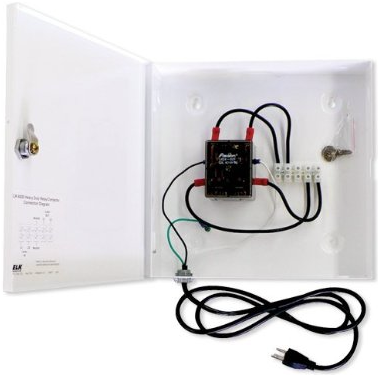 Elk Heavy Duty Relay Contactor in a Lockable Metal Structured Wiring Panel Enclosure ELK-9200 If you have something like a pool pump, or any device using up to 60 Amps, then this device is the way to go. An electrician runs the 12-3 Romex wire to this box, then you simply plug the power cord into an Insteon controlled outlet. It’s a shame Apple didn’t buy Nest. I feel much more comfortable when the business model is built around selling hardware. Not the data. Only time will tell if I made the right choice in the long haul. Meaning, will the next-gen of Nest products, funded by rich-uncle Google, make me green with envy? Meanwhile, I've protected my family affordably for years already, way before Nest had smoke detectors. My much lower cost group of wirelessly-interlinked smoke/fire/CO detectors have been vigilant these past 4 years already, beefed up in 2013 with added integration with Insteon allowing mobile text alerts and water leak detection as well. So no regrets here! If you are using a Hub (or SmartLinc), here are some suggestions to help improve its security. DO NOT use the same password for your bank account, Facebook, email, etc. See also TinkerTry.com/linksys-ea6900-802-11ac-wifi-router-security-best-practices, where I also indicate UPnP should be turned off.